True High Voltage Plasma Arc Colloidal Gold 200ppm 72hour Batch Time. Contains Only 100% Pure 99.99% Gold using the Underwater Plasma Arc Method. Features No Salts, No preservatives, No Additives, No Chloride (Gold Chloride), No Reduction Agents, just Pure 99.99% Gold. So many companies talking about so many things, if your fed up then get the real High Voltage Colloidal Gold. All others are simply low voltage machines producing Red or Dark Purple Solutions either with or without salts in which they are either poison or useless due to particle size. Colloidal Gold can only be "true or real" when produced with a High Voltage Generator using the Underwater Plasma Arc Method. Red Solutions and Purple solutions regarless of what you have read or have been told are useless against your cancers or arthritis or even brain clarity. 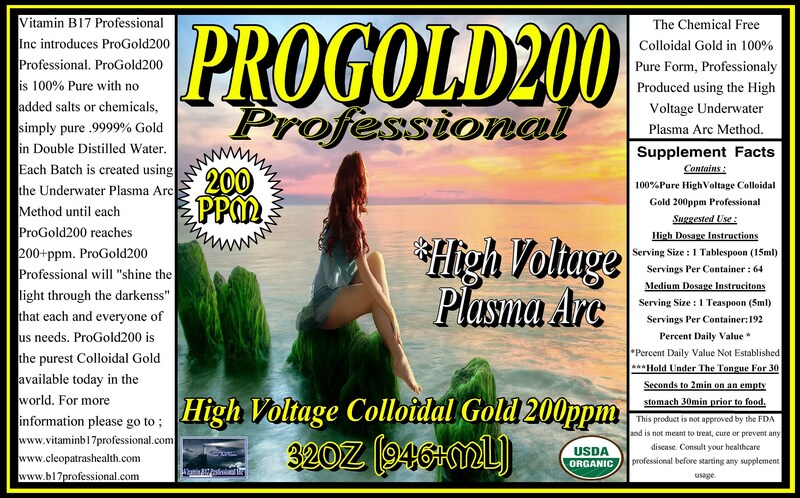 Do your research and only buy Professional High Voltage Plasma Arc ProGold200ppm. HV ProGold200 can be taken with other colloidal solutions such as "Secret B17 Rhodium Professional", ProCopper200 Professional, and Colloidal Silver Professional.